I have 3 screens which I would like what would be the best method to organize them. In mobile phone is straightforward, just 3 Activities for each screen would be enough. In tablets the system is different. I know that most Tablet applications use a List Fragment on the left, and the Details Fragment on the right. But in my case, the Details Fragment include another list. Both of them in phone will use Floating Action Buttons to add more elements to the list. However, I understand that having 2 FAB in the same screen is not a good practice. As you can see, Screen 1 is the first screen. When I press the FAB, we go to Screen 2. 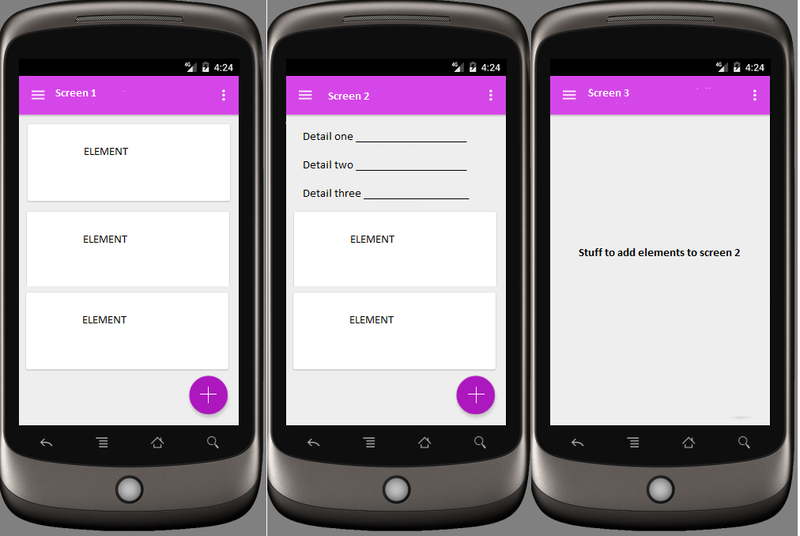 In the header we introduce details of the elements of screen 1, and there is a list of elements. In the FAB of screen 2, we go to Screen 3, where we fill details and then we add the element to the list of screen 2. And Screen 3 would be another one apart. Is correct to include two FAB as shown in the Picture 2? Or should I just leave the screen 2 FAB, and include the function of FAB from screen 1 in the Toolbar for instance? What is better, leave screen 1 and 2 in the same Activity, and open other activity for screen 3; or include all 3 fragments on the same activity, and therefore show all in the same screen in tablet? As you can see, Screen 1 is the first screen. When I press the FAB, we go to Screen 2. In the header we introduce details of the elements of screen 1, and there is a list of elements. What kind of content is on Screen 1? A FAB seems not to be the correct pattern to switch to screen 2. Floating Action Buttons are used to manipulate the content on the current screen, not for navigation. FABs may be used to create an item, change a (global, non item specific) status etc.. You should provide us more details and/or rethink the whole navigation concept of this application. Using a FAB for navigation will be confusing for your users. I think you might have to rethink on the interaction which you are providing here. I will first explain the use of Floating Action Button. There can be only one FAB as per the best practice. FAB is used as a shortcut for the most frequently used tasks with respect to that page/screen. It is not used for navigation. Here is my understanding from your question. 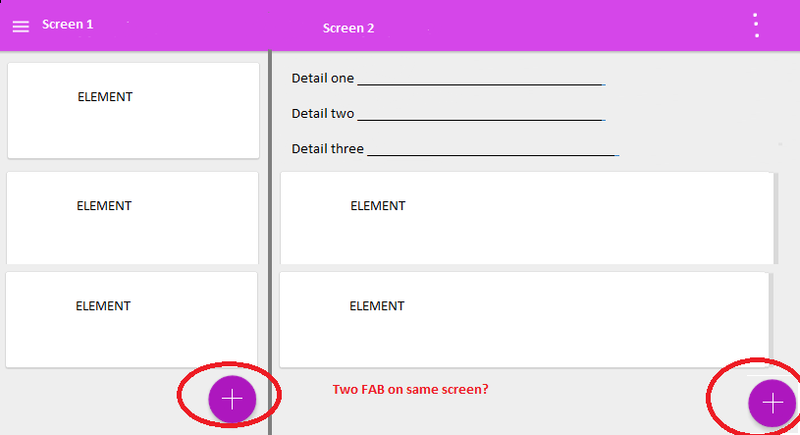 you are using FAB for navigating from screen 1 to screen 2.
when you click on the FAB, it will take you to the next screen when you will enter the details of the elements shown in the screen 1. If my understanding is right, I can suggest you on how to solve your scenario. Use cards. When you click on the card, it can expand and show the fields for the details. This could very well work on tablets too. Not the answer you're looking for? Browse other questions tagged android tablet listview or ask your own question. Do users notice bottom bar tools on tablets? Alternatives to tooltips in tablets?